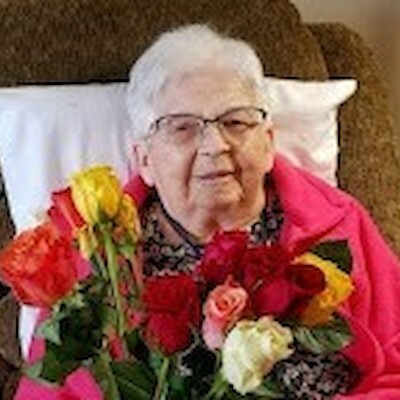 Mavis Marie Ostedt Age 91, of Rice Lake, WI died Tuesday, March 19, 2019 at Care Partners Assisted Living in Rice Lake. She was born on August 17, 1927 in Rice Lake to William and Rose (Doubek) Siewert. Mavis graduated from the Rice Lake High School in 1945 and was married to Henry Ostedt on October 27, 1951 in Rice Lake. They owned and operated Bill’s Outboard Service in 1958 until retirement in 1986. She loved square dancing, shopping, growing roses, gardening, traveling and taking care of her grandkids. Mavis was a member of the Rice Lake Moose Lodge and St. Joseph Catholic Church. She is survived by a daughter and son-in-law, Jan and Frank Petit of Rice Lake; a son and daughter-in-law, Steve and Janine Ostedt of Birchwood; 5 grandchildren, Sheila (Wayne Jr.) Whitman, Melissa Schene, Jeremy (Becky) Ostedt, Kara (Aaron) Thompson and Lindsey Ostedt (Miguel Couto); 6 great grandchildren, Tisha (Duaine) Widell, Brandon Whitman (Autumn Teasdale), Jenna Schene, Shayne Schene Jr., Lucy Ostedt and Olivia Ostedt. She was preceded in death by her husband, Henry Ostedt; a great granddaughter, Kaylee Schene; her parents, William and Rose Siewert; and a brother. A Mass of Christian Burial will be held at 10:30AM Saturday, March 23, 2019 at St. Joseph Catholic Church in Rice Lake, Father Ed Anderson officiating, with interment in the Northern Wisconsin Veterans Cemetery in Spooner, WI. Visitation will be held from 4-7PM Friday at Appleyard’s Home for Funerals in Rice Lake and for one hour prior to the Funeral Service at the Church. There will be a Women of the Moose Service at 7PM Friday at Appleyard’s Home for Funerals.